Affordable industrial storage space can be difficult to find. Between the actual storage cost, delivery charges to get it there and back when needed, the inconvenience of transporting can be expensive and annoying. A.B. Richards is known for providing affording, easy, on-site industrial storage, no matter your needs. A.B. Richards’ customers save hundreds of dollars each month on their industrial storage costs. See what A.B. Richards can do for you. Why Use A.B. Richards for Your Industrial Storage Containers? Low Cost – Between great costs per square foot of rental space and our price incentives, A.B. 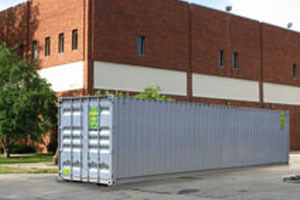 Richards’ on-site storage containers are highly affordable – as low as $4 per square foot per year. Convenient – We deliver right to you. No need for the aggravation of off-site storage. We bring the storage container directly to you. Fast – No long waiting periods. A.B. Richards will deliver your on-site storage container within days, and our storage experts can answer all of your questions. 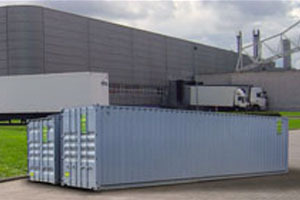 Flexibility – Industrial on-site storage containers improve efficiency by keeping your equipment and materials on site. When you’re done, call us and we’ll remove it. Durability – All of A.B. 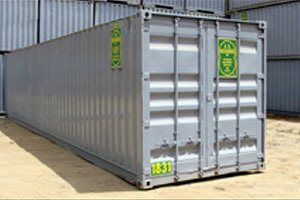 Richards’ storage containers are made of 14-Gauge Steel with completely secure, locking doors. Versatility – With three different size storage containers, A.B. Richards has an option for your needs. The 20’ industrial storage container provides 1,110 cubic feet of storage space for smaller projects and records storage. The 40’ industrial storage container more than doubles the usable volume with 2,385 cubic feet of room. Finally, the 40’ Jumbo industrial storage container provides an additional foot of overhead room for storage of larger bulkier items or equipment like a standard-sized forklift.